When I watch the videos, I see Ethan in a way that I NEVER get to see him – without us. No parents. Not even the siblings who occasionally stand in with the carefully crafted direction and assistance we often provide. Camp PALS does not look like the ‘staff and client’ relationship that we are becoming acquainted with in the adult system. 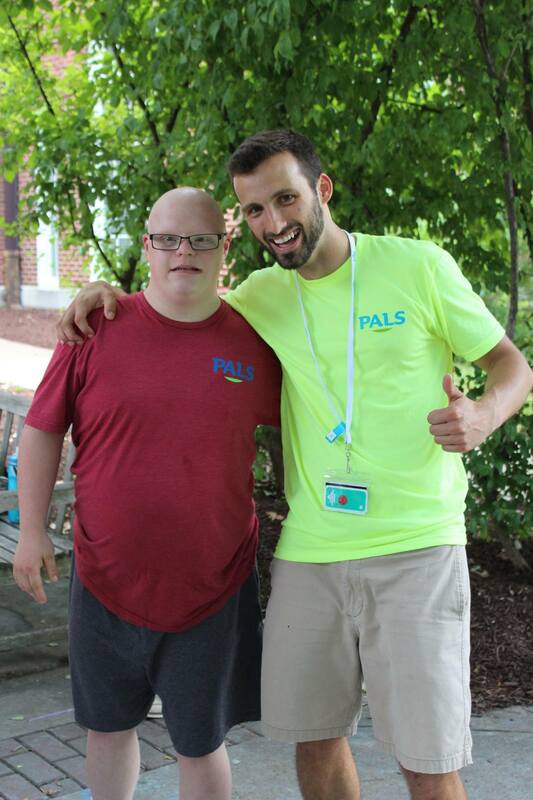 Most of the people who volunteer with PALS are practically the same age as him. The word ‘buddy’ and ‘pal’, ‘sister’ and ‘roommate’ dot the vernacular at Camp PALS. People talk about friendship and LOVE. Seriously, did you watch any of the videos?! The closing ceremony that was held when we came to pick up our campers had it’s own palpable shape and feel – like a water balloon stretched too tightly and filled to the top with water. I felt like if I touched it too suddenly, the sides would burst and it’s contents would end up in a puddle on the floor. One by one, campers, counselors and parents stood up in an attempt to convey what the week of camp meant to them. Gently, the balloon deflated as the tears shed by those attempting to speak rolled slowly down their cheeks and decompressed what many of us were feeling. We witnessed something special and practically sacred. A single mom experienced the only week of her year in which she is not a full-time caretaker. To top that off, her daughter had the time of her life – at least for that year. A young male counselor said he believes the week did more for him than it did for his camper. He was profoundly changed by a young man with Down syndrome and without pretense. A mom spoke of being able to watch her daughter literally blossom before her eyes in the videos, participating in activities that she would not normally engage in without her beautiful and energetic Camp PALS cohort. I didn’t speak at the closing ceremonies. I absorbed the sites, sounds and sentiments during a set of very unique circumstances, like a sponge that was plunked down in a puddle full of joy and gratitude, and all I could do was take it all in. Sure, I could have talked about how I enjoyed a MUCH quieter house the week Ethan was at camp, or about how I was grateful to be relieved of some of the care taking duties in my life. I am, in fact, very thankful. But it is not what I am most appreciative of. I loved watching Ethan navigate life, activities and friendships out from under my watchful eye. I liked watching him be who he is without me – which is someone who tucks his t-shirt into his shorts, even when it is not the best look for him. Thanks for not being us and for spending your time and using your talents in such a profoundly life-changing way. I read your post with tears in my eyes-tears of gladness, not sadness. Thank you for sharing and thank God for you and Ethan.